← November Islamorada Fishing Report, gulf of mexico turns back on! Winter time fishing Islamorada is off to a good start. It started blowing good out of the northwest today after being flat calm yesterday. Cold front moving in, however this should light up the spanish mackerel, and push some trout and redfish in the ditches and deeper creeks they like when its cold. 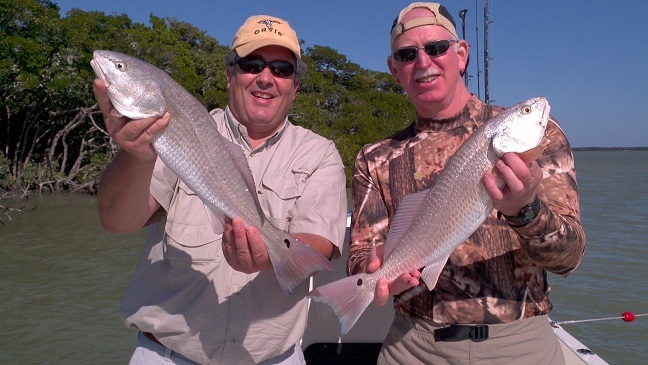 Had John and Jay today, we started the morning fishing for redfish in florida keys. It was pretty good with the higher water, caught 30 or so in a couple hours, only moving twice and leaving them biting. Several nice fish in the 18-22 inch range too we caught a couple for dinner. After this we went looking for trout for more table fare. Some trout had moved into a few nearby channels that they often do when its colder, nice to see them their early as trout is not being closed this november/december in our area. Pilchards were the trick for bigger trout, bouncing them slowly on the grassy bottom. November fishing florida keys is often best with live pilchards, they are usually plentiful as the northeasterly winds push them onto the ocean side flats and can be easily found most mornings by the birds bombing them. After we had our fair share of trout fishing, the boys wanted to try for something bigger. We had a couple ladyfish and jacks for bait as well as pinfish, so I ran out to a hole for some sharks or possibly big goliath. We put a ladyfish on the bottom and some pinfish out for a possible cobia. Backcountry fishing in Islamorada can produce a number of amazing fish you may not think possible to catch, but you don’t know unless you try! We ended up getting a bit on the big bottom rod and the line scoped up to the surface. At first I thought it was a blacktip shark, but it turned out to be about a 10 lb cobia! Of course he ate the wrong bait, but it was fun to catch him none the less, and of course release since he didn’t make the cut. No shark or goliath bites to add to this islamorada fishing report and we headed home to meet up with the rest of their crew who also fished today. They brought plenty of fish to lazy days for dinner and will be back for sure next year! This entry was posted in Backcountry Fishing Reports, Fishing Reports and tagged cobia, ladyfish, november, redfish, trout. Bookmark the permalink.